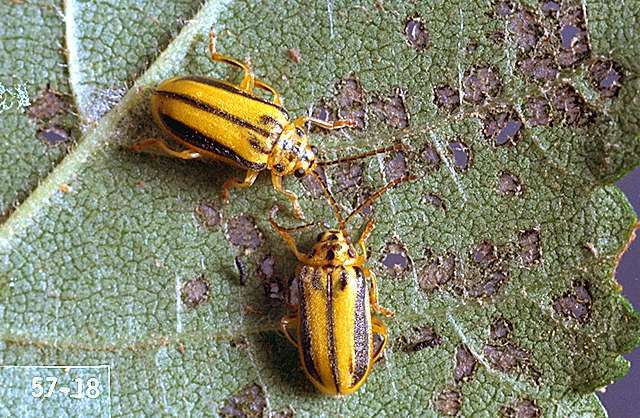 Pest description and damage Adult elm leaf beetles are approximately 0.25 inch long and yellow to greenish with two dark stripes. Older adults are darker. The 0.25 inch larvae are greenish or yellowish with black lateral stripes and spots. Elm leaf beetles feed on the leaves both as larvae and as adults. As larvae, they skeletonize leaves, feeding on the underside and eating all parts except the veins and upper cuticle, which then turn brown. Adult feeding causes small holes in the leaves. 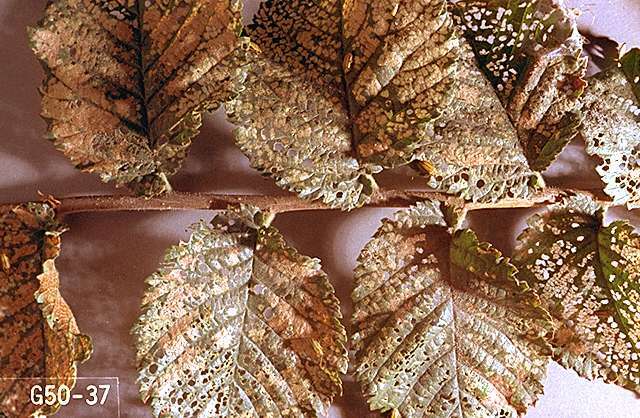 Severe infestations may result in severe premature leaf loss. Trees may releaf in late summer. Weakened trees are also more susceptible to attack by elm bark beetles, which can carry the Dutch elm disease fungus. Biology and life history The insect overwinters as adults in protected places both indoors (often invading houses) and outdoors. In spring, the adults fly to trees as the leaves are expanding and chew circular holes in them. 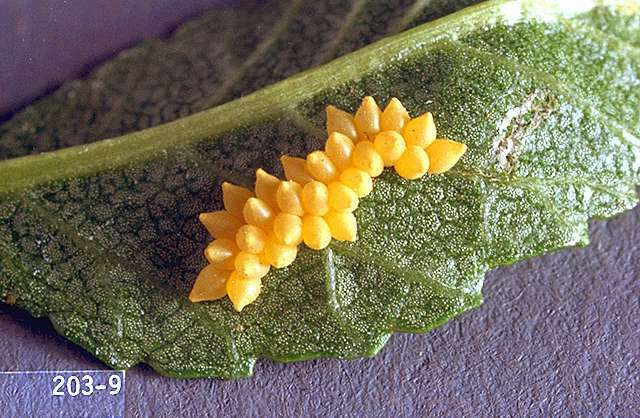 Clusters of pointed yellow eggs are laid on the leaves, and the larvae hatch in late spring (typically May-June) and begin skeletonizing leaves. They feed for a period, then migrate to the lower parts of the tree and pupate on the ground or in crevices near the base of the tree. The second generation emerges 1 or 2 weeks later. There are two generations per year. 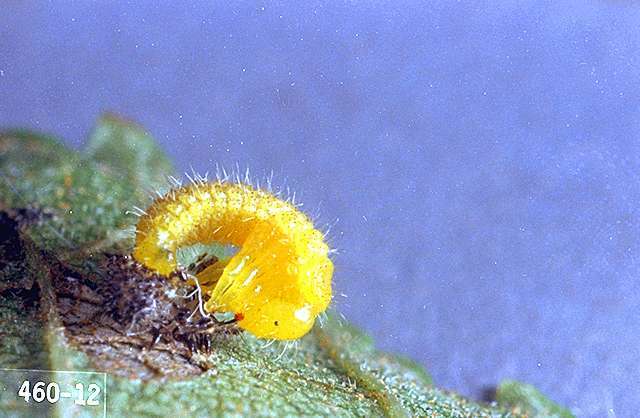 Pest monitoring Watch for emerging adults in spring then watch for small circular holes or skeletonizing of the tender new leaves as larvae feed. Best control is achieved when larvae are small and before damage is severe. Plant resistant cultivars of American elm (Ulmus americana). These include 'Dynasty,' 'Princeton,' 'Prospector,' 'Frontier,' and 'Pathfinder.' (Note: Many American elm cultivars are highly susceptible to Dutch elm disease). Other elms reported to be somewhat resistant to elm leaf beetle feeding include Chinese elm (U. parvifolia) and the elm-like zelkovas (Zelkova spp.). Provide proper culture to maintain plant health. Healthy plants are more tolerant of insect damage. Prune dead and dying branches in late fall or winter. A shopvac or mower with catch bag may be able to remove larvae that drop to the ground to pupate.